Thinking back to his early years as a researcher, Mark C. Wilson, senior lecturer in the Department of Computer Science at the University of Auckland, says he was giving away copyright to his articles without realizing the repercussions. Like many scholars, he wasn’t focused on the serials crisis crippling library budgets, caused by corporate publishers using opaque bundled subscription models (aka Big Deals) to charge exceedingly high prices for academic journals. That was until mathematician Timothy Gowers’ exposé of Elsevier’s Big Deal prices and the launch of The Cost of Knowledge boycott opened the eyes of many in academia, including Wilson. As he began to realize how corporate publishers were using their positions of power to attain profit margins in excess of 30% for publicly-funded research, Wilson knew he needed to take a stand to bring control of journal publishing and pricing back to the nonprofit sector. He became committed to understanding and educating others about the serials crisis and alternatives to the corporate publishing model. In recent years, Wilson has channeled his knowledge into action helping to form organizations aimed at flipping journals to academic-led models and at fostering existing academic-led titles. In late 2016, Wilson was a founding board member of MathOA, an organization dedicated to helping mathematical journals “flip” to open access models. MathOA has already had promising success, including helping the editors of the Journal of Algebraic Combinatorics, who resigned from the Springer title in 2017, flip the journal to an OA model under the name Algebraic Combinatorics. 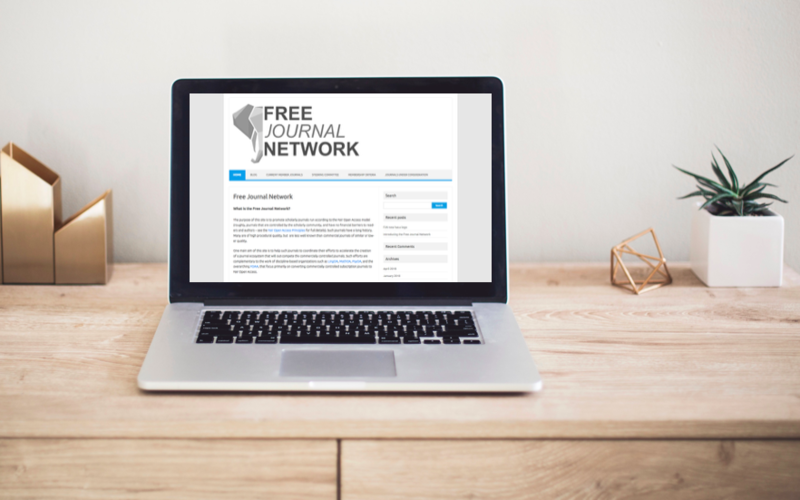 This January, Wilson and a group of colleagues also led the launch of the Free Journal Network (FJN), a site aimed at promoting journals run according to the Fair Open Access Principles, which Wilson helped draft in 2017. What started as an informal group has since become a growing community committed to providing scholars with resources to run and support academic-led journals. In the interview below Wilson discusses how MathOA and FJN got started, the core aims of the organizations, and plans for the future. When did you first become involved in academic journal publishing? What has your journey been to get to the point of starting the Free Journal Network? MW: I think it goes back to the Elsevier boycott. Before that, I was just doing my work giving away copyright to corporate-run journals. But then I saw The Cost of Knowledge project and started to realize what was going on– corporate publishers were exerting copyright control over research and raising journal prices to unsustainable levels. I signed the boycott and, after that, I thought I should do something more. I spent a few years just going to discussion forums like Math 2.0 where people were talking about these issues in publishing to try and understand what was going on. I was trying to explain it to people and I was writing newsletter articles about it at the time. Then around 2015, I saw one too many blog posts on the topic. I think one was Björn Brembs basically saying– “Why haven’t we already canceled subscriptions? How long will it take?” I decided I’m sick and tired of reading these articles, I have to do something. So I convened an email group with 12 active people including Björn, Tim Gowers, Alex Holcombe, Benoît Kloeckner, and Johan Rooryck. And then from there, we decided to launch MathOA. Johan had already started LingOA having flipped Glossa so we had some footing in the humanities. We decided to extend to mathematics and psychology as well. Once we’d established our model we started trying to raise money for journals and to reach out to journal editors and convince them to join. Right now we really need to get more community buy-in and more people actually working to support and launch academic-led journals. So I started out a GitLab forum with Dmitri Zaitsev. The idea for the forum is more than just starting a discussion. We want to actually do something. I’ve said that this is the last year that I’m going work this hard on convincing scholars to move to academic-led models. I want to start seeing some major changes. So the first thing is to get more people involved with the forum to spread information. The second thing I decided was we have to help the new journals that are doing the right thing and support flipped journals, which is the point of FJN. When you leave a big publisher, at least at the moment, you are kind of on your own, which can be hard. But together we can improve the visibility of flipped journals and share resources. I am trying to sell some libraries on the idea that they should support flipped journals and community-led journals because it’s very cheap. The cost of one journal subscription to the average journal by one university library would actually help as many as 10 of our members do simple things like assigning DOIs and getting occasional help from editorial assistants. At the moment they do it all themselves, so almost anything would be good. I want them to share promotion and resources and to keep growing an academic-led publishing network. To date we’ve looked at more than 100 journals, we’ve invited maybe 50 journals, and we have accepted 35 at the moment. On the 31st of May we’ll conclude for the year and focus on our current members, we won’t start looking for new ones until next year. What are the main issues you see with the predominant journal publishing system? Is making all journals OA the full solution? MW: The number one issue is journal ownership. Principle #1 of the Fair Open Access principles is that we should have community ownership of journals, ideally among nonprofit organizations. This includes organizations like the American Math Society. AMS could easily transition to running their own journals, and they’re amenable to community influence. But I think, ideally, each journal can be run by an even smaller organization just dedicated to the journal so the people working on the journal are totally invested in it. That’s the number one problem is the publishers owning the titles. If the publishers didn’t own journal titles it would be so much easier to just change publishers without worrying about losing the journal brand and submissions and readers that come with it. If the academic community controlled journal ownership and used peer review and publishing tools like Scholastica to provide a proper service then I think pricing would be fine. The issue now is publishers owning the journals and trying to squeeze supernormal profits out of them through their monopoly position. I think a lot of people agree with me on those issues. Personally, I also think we should improve some journal processes. I think there are too many feudal editorial and publishing processes out there all based on hierarchy. Of course, there has to be some kind of hierarchy but we have an excessive amount in academic life. You need a lot of people helping each other within journals and more community input to share the work and keep things transparent. A lot of the new journals being created like Discrete Analysis have models where they share the work around the editorial board and have transparent publishing practices. There’s also a lot of women who are overlooked for editorships. I haven’t done a study of this, but anecdotally, I think there are a lot of women that should be editors and are not. I think we can help with that as well as the pricing and the access issues. I think it all starts with academic ownership of journals. FJN is working to promote this and to slowly increase the standards of our members, for example by getting them in DOAJ and creating some discussion and sharing of publishing best practices so more academic-led journals can start and succeed. These people are really dedicated and have done tremendous service to the community and I want people to realize that. What sorts of publishing best practices do you hope for FJN to impart to journals? And the other thing is archiving, which isn’t a huge issue but it’s something we want to help these journals with. But that’s the least of our worries, if everything is OA there will be lots of versions downloaded so it’s less likely to lose these papers. But things like LOCKSS need to be used. So DOIs, licenses, and archiving are the main things I want to work on this year. Do you think all of the tools are out there for academic-led publishing to take over now? MW: I think it’s actually very simple to run a journal now technically because of the software tools that are out there. I believe that from everything I know, Elsevier and other publishers’ software is inferior to software like Scholastica. I have heard of editors at journals using Elsevier asking if they could switch software because Elsevier’s isn’t good enough, I even know of one journal that switched to Google Sheets. This is how pitiful the service that publishers are providing is, so we want to really put publishers in their place. The things I am talking about are problems the community can fix. So my grand goal is to gradually get a conversation going, which is why we have this forum, to draw people in and get them to realize what best practices are because at the moment everything is secretive. We need to all get together and work as a research community to not outsource journals to corporate publishers. We do all of the work in journal publishing anyway, so we’re basically just outsourcing brand and reputation management to publishers, which is very dangerous. And universities are outsourcing review of their own staff to these journals by way of impact indicators, which makes no sense. Brembs has pointed this out. And we have to stop doing this and take responsibility for ourselves as a community. I think it’s especially important for more junior people to get involved in these projects. I am trying to get in touch with graduate students via blogs and Twitter to get help for FJN. I am worried about young people as a group– junior researchers really have to think towards the future. Some of them have 50 years ahead of them where they could be working in this area. I think they need to make their voices heard. So more people, more variety, more transparency, more shared work. One of the other things I have been working on via MathOA is approaching various funders and libraries to get money for journals. We have more than enough to run a few journals using Scholastica, for example. The big thing now is finding the editors to take the plunge to flip their journals – we’re stuck at that at this point. So we’re chipping away at it. You can see there are FJN journals with excellent editorial boards that are free to read, well organized, and come out on time. There is very little that professional publishers are doing that these academic-led journals aren’t doing themselves. And then with tools like Scholastica you get a fancier website, help with the mobile issue, and things like that very cheaply. So I think it’s only going to get easier for the academic community to run journals. What, if anything, is holding back the scholarly community from transitioning to academic-led journal publishing? MW: What confuses me is why established academics still send papers to corporate-run journals and implicitly support their business model when they could send them to perfectly good alternate journals like FJN ones. I don’t know the answer to that question. But it does seem that more academic-led journals have been created recently and I think that’s due to having better tools. There is still a lot of work to be done but it is clearly much easier to run a journal now. We just need scholars to commit to supporting this new model. If we get into OA Big Deals it will also be a disaster so that has to be stopped. Obviously, the publishers would love that, it’s a guaranteed income stream for them. So I think we really need to push the idea that corporate publishers should not be allowed to own journals and we shouldn’t be going for this pay to publish model anyway. Someone has to cover costs, but it should be in the academy and authors should not be turned away because they can’t pay a publisher. We’re publishing research for the public good, we’re not doing it for private advantage. If we get to the point where some researchers can’t even afford to publish their work and administrators still think corporate brand journals are more important then we will have a big problem. I think there is real urgency here. Why is now the time for academic-led publishing? What would you say to scholars who aren’t sure? MW: I think it’s an obvious idea, of course the academy should be running journals. We had to outsource to publishers in the past because we couldn’t physically typeset and print journals in the print era, but in the electronic era there’s no reason not to do it ourselves. I think there are just journal brands that are hard to get rid of. At MathOA, we want to try and flip them. The time has come and it’s more than overdue. I hope to see Fair OA models grow. The Fair OA principles took a lot of work to develop, though it seems simple, we didn’t want to alienate groups or models. Some people will criticize them for not doing enough but I think they’re a pretty good step. Some people will say academic-led publishing won’t work because academics are amateurs but it’s just not true.